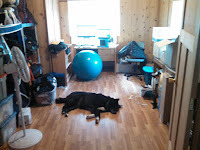 OK, writing isn't really like kayaking at all in the literal sense, aside from the fact that you're normally sitting down when you do either one. But in a much more figurative and existential sense, and definitely in how I relate to both disciplines, they have a lot in common. [For new readers: in addition to this blog and my upcoming memoir, I write fiction under the pen name Blair B. Burke] In fact, I think you can find most of these traits in just about any endeavor as long as you look for them. It's really about enjoying whatever you do. One thing you hear from kayakers is that you never paddle the same water twice. The ocean, in particular, is always changing. The same spot might be foggy and moody, bright and dynamic, mellow or challenging - all in the same day as weather changes, tide falls, and swells rise. Rivers are vastly different at different flows. An easy run of rock-dodging at low water turns into big-water play at high flows. Even your local lake changes from winter to summer, afternoon to sunset to moonlight paddle. And even if you managed to keep everything else the same, changing who you're with creates a brand new experience. The constancy of change is what draws us to the same areas time and time again. Writing offers the same sense of wonder and exploration each and every time I sit down at the computer. Every story is new, the people in it change as it goes. If I'm writing a fight scene it's never the same style as the last one; a meeting between characters changes with their personalities. Even if I have to go back and re-write a scene that wasn't working, a single different word in the first sentence will send me down a new path and into the unknown. The only thing that gets old and repetitive is the editing, but that's the equivalent to practicing rescues. It's not always exciting and fun, but it's where you learn new things through hard work and essential if you want to improve. What draws many people to kayaking and other physical pursuits of a similar nature is the sense of being in the moment. When you're at the lip of the drop or watching the wave start to form behind you - your entire focus is on what you doing right now and what's coming in the next second. The rest of the world falls away. Last week's trials are long gone and Monday's staff meeting is too distant to even acknowledge. It feels like what being alive should feel like and the smart ones are those who bring that feeling into their everyday lives. When I write I start with a full water bottle and snacks nearby. I know from experience that I can lose myself for hours, so much so that I'll eventually look up and realize the sun has set, I'm parched and starving, and my bladder doesn't care if I finish this chapter. You can pour all your energy into what you're doing and still come out more energized than when you started. That's pure joy. If you think it's nice to travel to someplace rare and beautiful, it's even better to create it. Not all my worlds are pretty - some are grimy, filled with bad people, and lots of bad things happen. But I've gotten to go into space, go back in time, fly like a superhero and live the life of a cat. Writing is exploration, pure and simple, and it's a helluva lot cheaper with fewer security lines. And if the dreariness of a place ever gets me down I can brighten it with a couple choice words. Kayakers are a tribe. I can go anywhere and find folks to paddle with. People I've never met will offer to not only show me the water but also the best burrito in touch and maybe a couch to crash on for the night. If I forgot something they'll lend me their spare. They don't need to know which side of the political fence I'm on, what kind of family life I have, or how often I shower. Kayakers accept each other and form a community that's at once easier and deeper than how we interact with most of the world. The friendships you form might only last for one paddle, or maybe for a lifetime. Either way they really count for something in a world where too often society is filled with bland interactions that accomplish the necessary at the cost of true meaning. For all that writing is a solo endeavor, it has its communities too. They tend to be virtual - I have writing friends across the country and the globe who I've never met and probably never will. I also made some of my first new friends in Mendocino by joining the writing club in town. They're as diverse as kayakers, from teens just starting out and so excited to be in the club to eighty-year-olds who have written their whole life and are still happy to welcome someone new. Once again, all it takes is the knowledge that we are all involved in the same activity, that we've faced the same challenges and experienced the same joys. We have one thing in common and it's enough to build on. I'm happier when I write. I bring that joy back with me to my daily activities, and I'm a nicer, kinder, and more supportive person because of it. When life is hard I can daydream about writing. It's a refuge that protects me and a place where I can build back my energy to face the harsh realities. Yes, it can consume my time and draw me away from other people and other activities, but there are so many good things in life that we have to pick and choose of which we'll partake. Kayaking does all those things as well and I feel lucky to have found more than a single thing around which to build my life. And that's what we all do, kayakers or writers. At least we should. Find the things that bring us joy and spend our time there. Treat everyone we meet like they're part of our community, because whether we know it or not I'm certain we have something in common. One of my kayaking friends, who passed away far too young, had the most diverse group of friends, many of whom were completely unaware that he kayaked (even though he was on the kayak polo national team with me). If there's one thing I learned from Albert, it's that everything you do can and should make you happy. Writing, kayaking, eating, dancing, laughing, working, getting married, raising kids, moving apartments, or simply waking up in the morning. Treat life like you mean it and go out there and do your thing - whatever it is. I'm almost there! After a year of work, with plenty of distractions and full-time jobs getting in the way, my kayak memoir A Paddler's Journey is almost ready to be published. It will be available in paperback and multiple eBook formats. I'm excited and nervous, but I'm happy with how the book came out and in the end that's what matters most to me. I know I have a lot of friends and readers out there who are looking to support me in this endeavor, so I thought I'd let you know what you can do to help. Don't worry, most of it is painless and involves very little work on your part. You might even find some of it fun. OK, this is obvious. But there are different ways to buy the book, so I thought I'd explain them a little to point out which way helps me the most. First, start on my website. I've completely redesigned it (you can check it out now but the book-buying page isn't live yet). If you buy the book directly through the links there I get more money. I'll also be offering a discount on the paperback - so you'll actually save money too. And I'm going to be selling signed copies of the paperback directly through the site. These will cost a little more, but that's because it takes me more time to sign and package them and pay for the shipping. But direct purchases do give me the highest profit margins. It also helps out if you all buy the book at once. That pushes the book higher in the rankings at sites like Amazon which helps get the book more visibility and encourages other people to buy it. So if you plan to buy the book at sometime, you might as well dive right in and buy it when it launches on August 2nd. This is how books get sold these days - through reader reviews. Again, there's more effective and less effective ways to do this. First, be honest. Tell people what you really thought, what you liked, what you didn't. Friends and family raving about the book doesn't do anyone any good. If doesn't have to be long, but even a couple of quick sentences really count for more than merely given it a star rating. Second, review it where you got it. Places like Amazon generally don't weight reviews if they don't think you've read the book, and they don't believe you read it if you didn't buy it from them. That does bring up a little hick-up because if you buy it direct from me (which I hope you do), any Amazon review won't be 'verified' even though you have bought a book made by them (I'm using Createspace to print the books and it's an Amazon subsidiary). I'm still working on how to solve this problem. I might throw in a code to get the eBook for free if you buy directly from me. That way not only will you get it signed, but you can 'buy' the eBook and leave a review. Once again, I ask that you only leave a review after you read the book and are honest about it. I'm not trying to game the system but to help everyone get real information. Feel free to talk about my book. To everyone. Everywhere. Maybe your friends who don't paddle would like it - it's written for everyone to enjoy, not just die-hard kayakers. They might even understand a little more about why we all love this sport so much. If you belong to a kayak club or forum on the web, maybe those people would be interested in the book. Feel free to loan out the book (but also encourage those who can afford it to buy their own copy). In addition to reviews, it's social media word-of-mouth that helps to sell books. Facebook is still the big one and where I spend my time, but if you're on snapchat, instagram, tumblr, wherever, feel free to spread the word there. Again, be honest. If you don't think other people would enjoy it, don't twist their arm. My goal is to get my book to people who want to read it, even if they might not think they want to at first. It makes me feel all warm and tingly to know that people out there enjoyed reading something I wrote. Leave a comment, send an email, drop me a message on Facebook. If you like this blog, I really think you'll like the book. 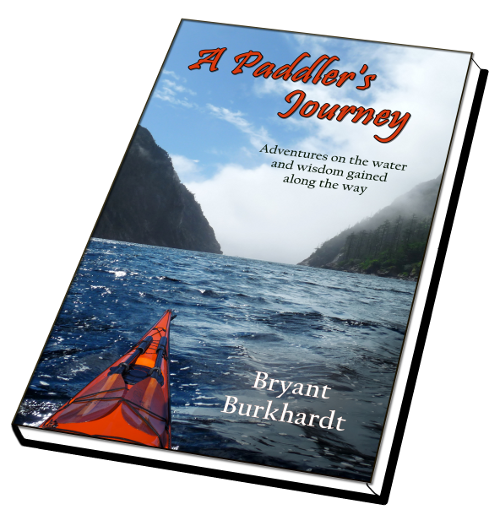 While each chapter is its own paddling story, the book format allowed me to connect them in a way that the blog doesn't. There's a theme and progression that goes from one to the next, and in the end they all add up to something more than just kayak adventures. You can simply enjoy the antics as I learn the sport through mistakes and setbacks, but if you want you can look closer and get something deeper out of it. Either way, it will be here soon and I hope you're all as excited as I am. One of the dangers of living on such a beautiful coast is that you start to take it for granted. It's easy to sit at work watching waves crash over the rocks and think that it's nice but feel no urgency to rush out and experience it directly. That's why it's nice when people travel for hours to get here and spend several days paddling, super excited about being on the coast and blown away by the water and environment that we have. Their enthusiasm rubs off and it's a good excuse to rinse the dust off the boat and get out there. This last weekend a big group (fifteen) showed up to play in the rock gardens. Busy with work, Lindsay and I could only join them for one day. They were camping at Russian Gulch and had paddled out of there a few times. They wanted to try somewhere new and suggested launching out of Caspar. I've paddled out of there a bunch, often to surf or do a quick lap around the harbor. I've thoroughly explored the stretch heading south down to Russian Gulch, but I've never gone north in conditions small enough to play in the many rocks that are there. We had a good forecast and decided to check it out. I have to say it really impressed me. It's not easy to stand out in Mendocino, where every place you look has stunning vistas and the shoreline is filled with caves, tunnels, and intricate rock gardens. But Caspar North was pretty remarkable. It's definitely more exposed and on a typical day it would probably be too scary to do much playing. But in 3-4' swell it's a blast! We had pour-overs galore and a number of really fun slots. We found some technical sections that were quite challenging on the bigger sets but also lots of forgiving features that could handle the silliness of the group. There was even a little cove with some surf waves - as long as you could dodge the rocks at the end. And getting to enjoy it all with old friends, and to make new ones as well, was a huge bonus. Afterwards we were treated to a bountiful dinner at the campground, happy to contribute some fresh caught abalone that Lindsay got the day before. On the one hand, it felt a little silly to see everyone sitting in camp chairs, laptops out as they reviewed pictures and video from the day. But seeing someone smile as they watched themselves go big, maybe the first time they really ran a large pour-over in this remarkable setting - you can't help but feel good at that. The other drawback of being busy working and writing about paddling instead of doing it: I'm out of shape. After a full day of paddling and playing in my Jive, which really needs some attention to the backband, is that my back totally locked up the next day and I hobbled around the house like I'm twice my age. But I did manage to update my website to get ready for my book launch. A Paddler's Journey will be out soon and hopefully I'll get back to creating new adventures instead of merely recounting them. More pictures from the day are at my Picasa Page.